Chatham Print & Design prefers clients to provide their files in PDF format. We also support Adobe Creative Suite, Microsoft Publisher and Microsoft Office (Word, PowerPoint and Excel). Native formats may require an additional charge. 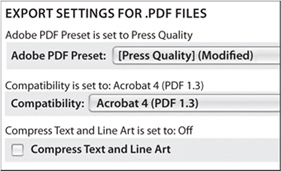 or create a PDF file (see above). If the special utilities are not used, then an additional charge will be required. Full color images and photos to be printed in 4-color process must be prepared in CMYK. Spot colors should be identified as Pantone colors. Files that require color conversions and/or changes will have an additional charge. A hard copy sample of the document is required so we will know what your document should look like. Multi-color documents should be submitted as separations. If a printed sample is unavailable, an additional charge may be required. Microsoft Office applications cannot be color separated within the application. If the documents are to be printed on a printing press, we must use special procedures and tools to separate these files, and that will require an additional charge. We will attempt to match the colors as close as possible. List additional files provided here as well as those not shown above. Question 2: Are photos and images saved as EPS or TIFF files? Question 3: Are graphics at least 300 dpi and actual print size? Question 4: Are fonts included separately? Question 6: Will you provide a hard copy of the document? Some files may require special prepress preparation so they can print properly and may require an additional charge. Our staff is available to assist you in preparing your files properly so we can meet your time, quality and budget demands. Many answers to your questions to properly prepare a file for commercial printing output are available in the HELP section of your application usually found at the top of the screen. Your Submissions: If you choose to upload or otherwise submit any material to Chatham Print & Design, including without limitation, video photographs, images, text, graphics, sounds, data, or files, by uploading, emailing or submitting in person such video or photographs you represent and warrant that: (1) you own or otherwise possess all necessary rights with respect to your Submissions; (2) your Submissions do not and will not infringe, misappropriate, use or disclose without authorization, or otherwise violate any intellectual property or proprietary rights of any third party; and (3) you hereby consent to the use of your likeness, and you acknowledge you have obtained the written consent, release, and/or permission of every identifiable individual who appears in a Submission to use such individual’s likeness, or if any such identifiable individual is under the age of eighteen (18), you have obtained such written consent, release and/or permission from such individual’s parent or guardian (and you agree to provide to us with a copy of any such consents, releases and/or permission upon our request).